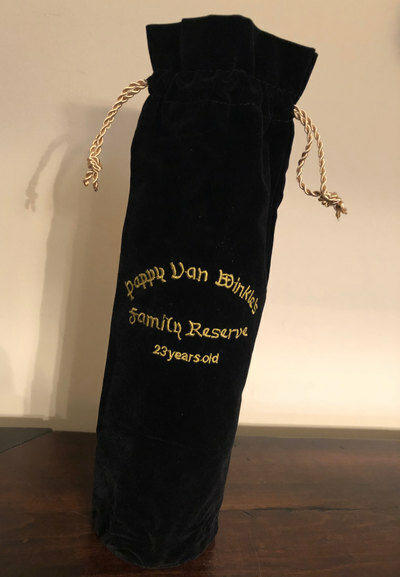 I can go long on this but the short answer is: beer doesn't get better with age generally speaking. 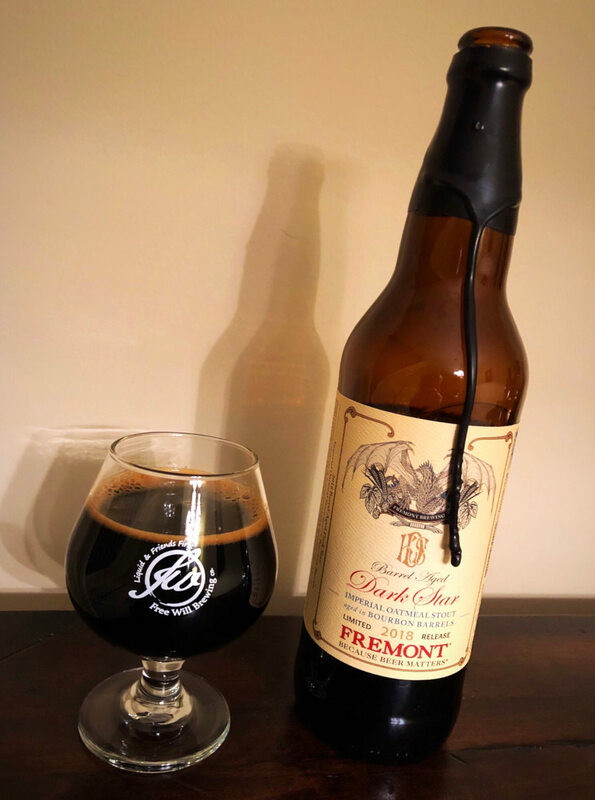 There are exceptions, active cultures being the most obvious, and some stouts and other big beers do ok, but how many barrel aged stouts can you honestly say got better? I pretty much agree! 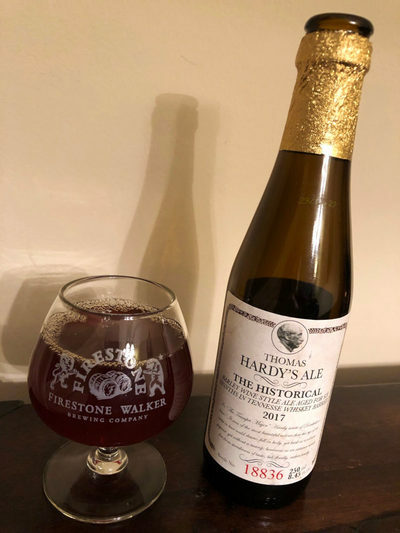 While I have experimented with aging beer, my repeated observation is that while it's always a different beer than it was fresh, it's rarely a better beer. And on top of that, we do tons of adjuncts, so from that small set of beers that got better, how many had adjuncts? Not many in my experience, the most common discussion is whether or not it held up which is basically hoping it's as good as it once was. We don't find cellaring beer to be worthwhile, most of the time it's not as good, almost as good seems like a win. 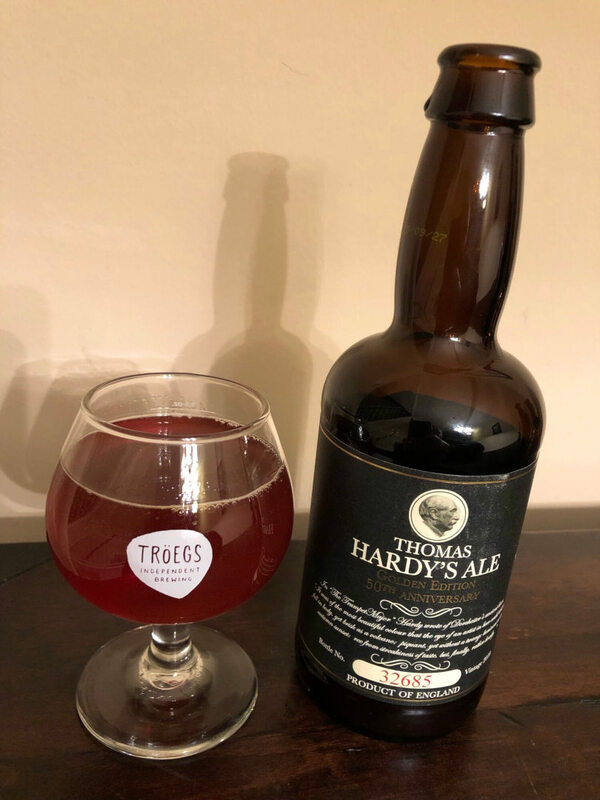 The tone most often struck in tastings of old beer is "it help up pretty well" and frankly we think our beer should be consumed rather than aged. We make a lot, more now than ever, drink what we packaged and more great beer is just around the corner. Ultimately it's a subjective decision, I respect that and am not here to argue whether you like it better or not but in our opinion our barrel aged beers don't improve with time. We did learn that non-barrel aged high gravity beers can benefit from them and we think the key component is yeast in suspension, with such a high density from the sugar the yeast is actually buoyant enough to stay floating around for a long time, months possibly, and it doesn't taste better with yeast, we are actually wondering if half the improvement we see in the beer through barrel aging is just giving it enough time for all yeast and sediment to fully settle out. 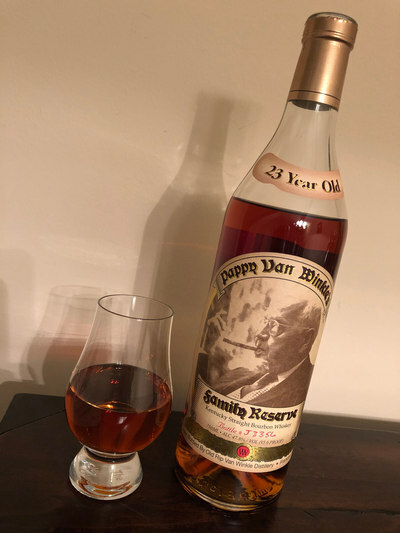 That remains speculation and just something new to ponder, post barrel aging though it's time to drink or hope "it held up pretty well" someday. It's funny, but the most successful aging experiments I've had involve things like Lambic (i.e. 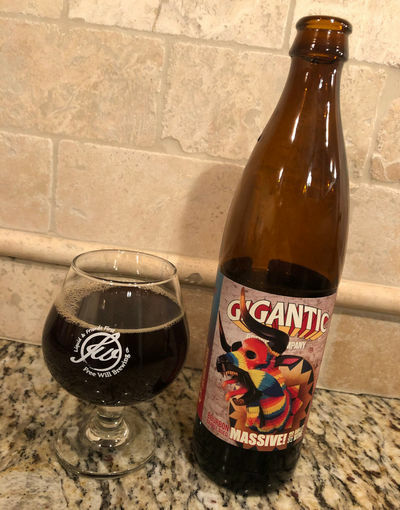 bottle conditioned beer with active cultures, etc...) or non-barrel-aged behemoths like World Wide Stout or Samichlaus. We could probably quibble over the degree to which the barrel contributes its own character (I think it's probably more than half), but it's a fascinating observation that some of the benefit of barrel aging doesn't come from the barrel itself, but rather allowing the time for yeast and sediment to settle out (and perhaps other age-related processes). As they say, this remains speculation, but it makes logical sense. Ultimately, my feelings on aging beer remain the same. It can be fun, but it rarely improves the beer, and barrel-aged beer tends to be just right when "fresh". Usually, if anyone asks me about aging beer, my response is always that you should drink it fresh first. If you can get your hands on another bottle, feel free to age it, but it probably won't get better over time (though it can still be interesting and a lot of fun). The lone exception in my book tends to be Lambic, but that's a sorta unique situation. 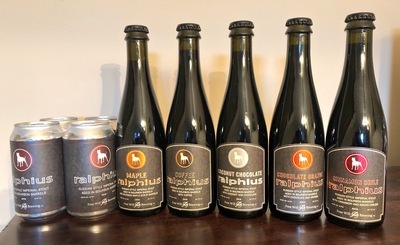 All of this is academic, of course, since the three barrel-aged Cycle beers that I managed to get my grubby fingers on were all gone within a week or two of acquiring. In the grand Kaedrin tradition of speculating on goofy or obviously wrong influences for beer names, I'm guessing Cycle named this beer after MS-DOS 3.0, an extremely rare release due to Microsoft's battles with IBM (3.1+ were much more common). 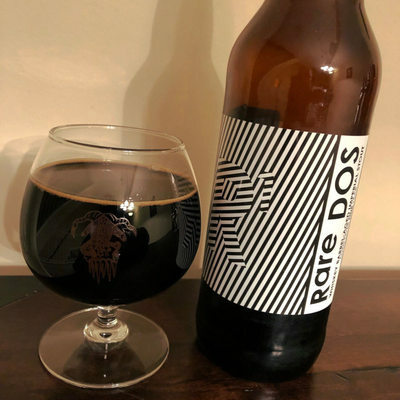 Or, possibly DOS is just an acronym for Double Oatmeal Stout. This particular iteration was aged in whiskey barrels for a full year. Windows has scanned the beer system and found no problems. This beer is pretty damn great. 0 KB in bad sectors. Beer Nerd Details: 11% ABV bottled (22 ounce bomber). 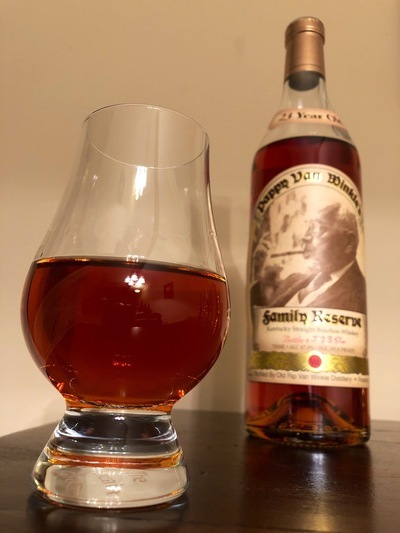 Drank out of a snifter on 2/15/19. Vintage: 2019. 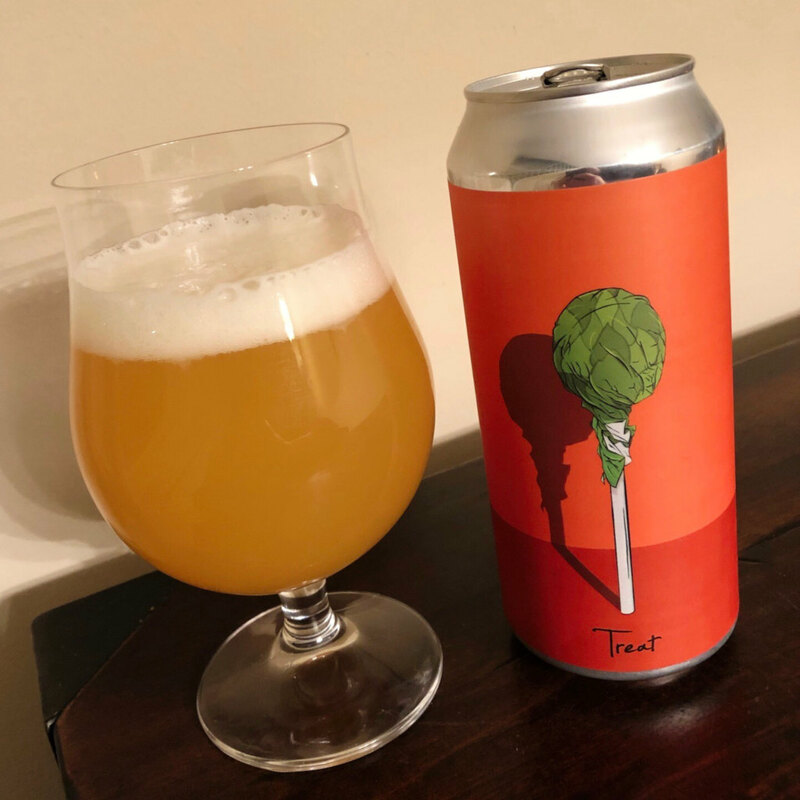 Beer Nerd Details: 7.8% ABV canned (16 ounce pounder). 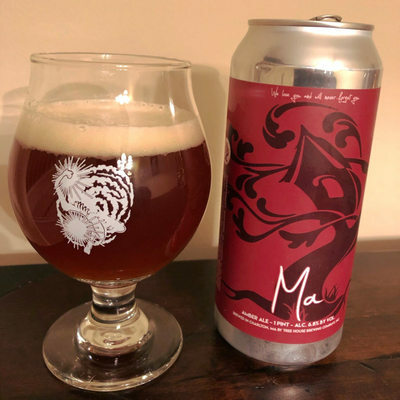 Drank out of a tulip glass on 2/15/19. 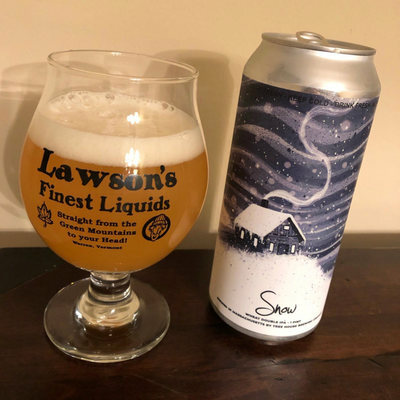 Canned: 01/17/19 (OUR SNOW IS BETTER, HARPER). Beer Nerd Details: 6.8% ABV canned (16 ounce pounder). Drank out of a Tulip Glass on 2/22/19. Canned: 02/05/19. Beer Nerd Details: 7.6% ABV Bottled (500 ml). Drank out of a wine glass on 2/21/19. I think I've nailed down the inspiration behind this beer. You see, the crew brought this beach-ball-shaped alien aboard because Sgt. Pinback thought the ship could use a mascot, but then it escaped and messed up the comms equipment, inadvertently triggering one of the thermostellar nuclear bombs. During the countdown, they tried to teach the bomb's AI a little phenomenology in an attempt to abort. What the hell am I talking about? This is the plot to John Carpenter and Dan O'Bannon's 1974 debut Dark Star (a clear truckers-in-space precursor to Alien, also written by O'Bannon). I'm positive that this relatively obscure movie is the inspiration for this beer. I mean, sure, it could possibly be the far more popular and famous Grateful Dead song, but we prefer to attribute brewers' chosen names with more goofy or possibly sinister influences. This is why you should keep reading Kaedrin: Come for the beer, stay for the cutting edge cultural references and unsubstantiated insinuations about breweries. Beer Nerd Details: 13.6% ABV bottled (22 ounce bomber, black wax). Drank out of a snifter on 1/18/19. Vintage: 2018. Another big winner for Fremont, and we'll definitely be seeing some variants of this beer and the most excellent B-Bomb in the near-ish future. If, that is, we're not all blown up by that pesky thermostellar nuclear bomb. I've basically given up trying to keep pace with Tired Hands. Even as they've started re-brewing various beers, I've found that I'll probably not even reach my previous pace. Accordingly, I haven't really been talking about them much here on the blog either. As of right now, I've written 37 posts covering literally hundreds of Tired Hands beers, most of which will never be seen again. 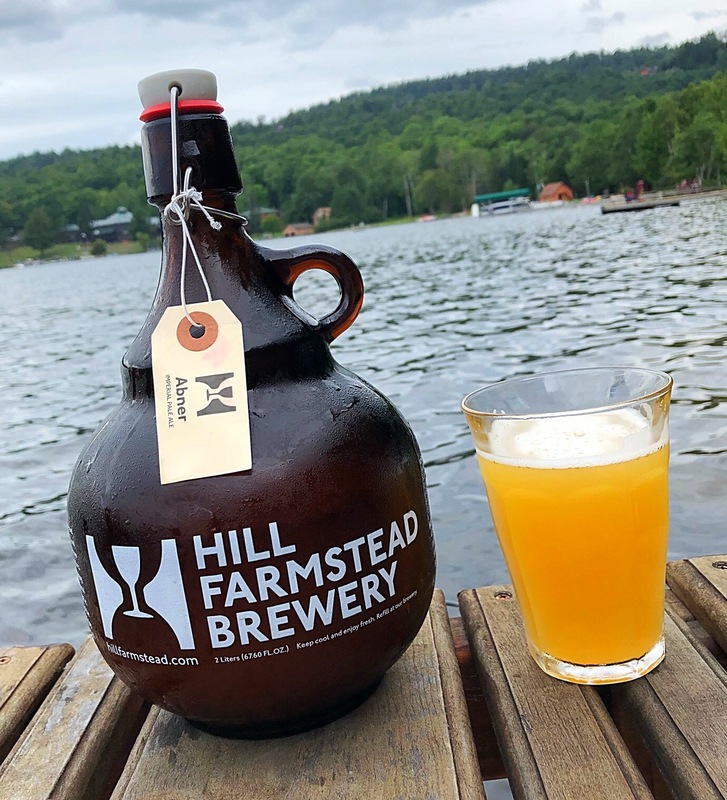 There's not a whole lot to say about the beer that hasn't been said, though the intangibles have shifted considerably in the past few years. Once the Fermentaria opened, production ramped up. Then they started canning beer, which generated huge "lines" on a weekly basis. Scare quotes around "lines" because what you'd usually find were hundreds of empty chairs put out around noon on a release day, and maybe a few bearded dudes standing around a few hours early. 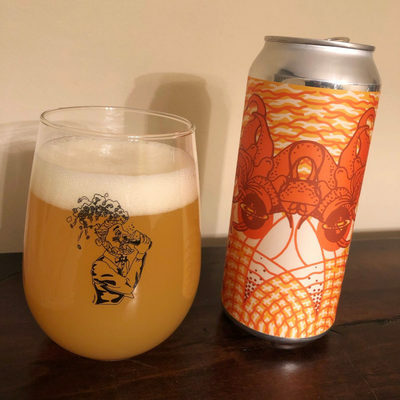 But the new hotness can't stay hot forever; entropy took hold and these releases started to unravel, only really getting crazy for their insane Milkshake beers. Bottle releases had long since dwindled (once they started canning hops, the demand for saison bottles dropped off a cliff), even for more prized and limited releases like the Parageusia bottles. During an impromptu visit on a random Tuesday, it turns out that the previous Wednesday's release was still available. The hype cycle has officially reached its end, I think. Perhaps insane popularity, long lines, and hype lead to backlash. Or maybe other local breweries stepping up their NEIPA game had an impact. Are NEIPAs are getting overexposed these days? Do insane "foraged" ingredients and other gimmicks grind people down? Maybe the polar vortex has people bunkering down and actually drinking the beer they have? All of the above? Beer Nerd Details: 9.3% ABV canned (16 ounce). Drank out of a tulip on 1/25/19. 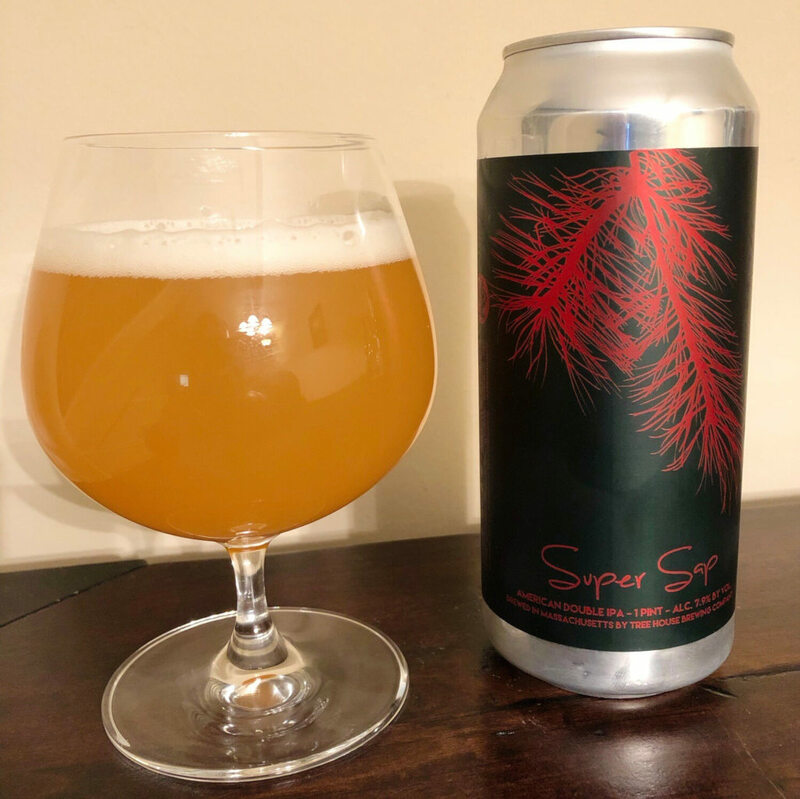 Canned on 1/16/19. There was a time when I would end up at Tired Hands once a week, but that time has passed. On the other hand, almost every time I do go, I think to myself "self, we should come here more often!" and then for some reason it still takes a month or two to get back. Personally, I'm almost always finding myself in the middle ratings. It's pretty rare that I hand out the highest rating available, and even more rare that I can find so little value in something that I rate it the lowest rating. When I shop any retailer with ratings, I always seek out the three star reviews. Why? Because those are people who put some thought into their review, acknowledge pros and cons, but ultimately approve of the product. You get a much better feel for what the product is by reading that than the person who's just like "best movie ever dudez!" or "this thing sux". Beer Nerd Details: 8.2% ABV growlered (2 liter swingtop). Drank out of a tumbler on 8/3/18. Growler filled on 8/2/18. Abner forever. Already excited for my next trip to Vermont, but then, when aren't I. 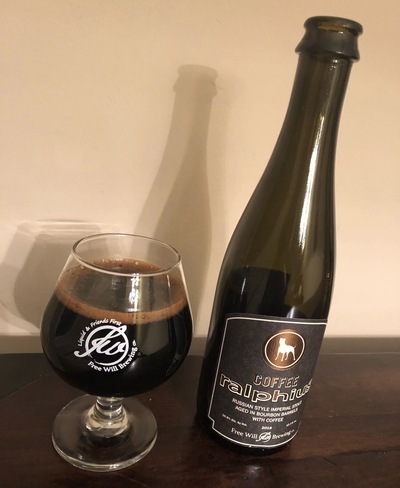 Free Will makes what is probably the best local barrel-aged stout, dubbed Ralphius. 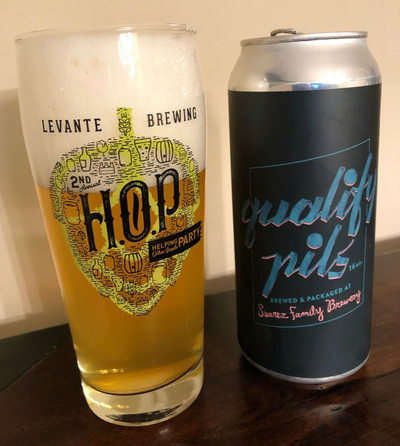 To be sure, there are plenty of one-offs that could contend (both Levante and Tired Hands could compete in this arena) and if you widen the "local" area, others will put up a good fight (or, uh, dominate). Beer Nerd Details: 16.6% ABV bottled (375 ml). Drank out of a snifter on 11/25/18. Bottled Oct. 2018. A total of 600 bottles were produced. Free Will Coconut Chocolate Ralphius - Aged with, you guessed it, coconut and chocolate - Pours deep black with a bit more head, half a finger that quickly resolves to the crown. Smells... a lot like regular Ralphius, some roast, caramel, and lots of bourbon, oak, and vanilla. As it warms and if I do the olephactory equivalent of squinting, I get some coconut. Taste is again pretty light on the coconut, but it's there, but the Ralphius base is its standard self. I guess chocolate is there too, but it doesn't really stand out. Mouthfeel is on point as well. Overall, a good beer, a bit light on the Coconut, but the Ralphius base keeps it going. 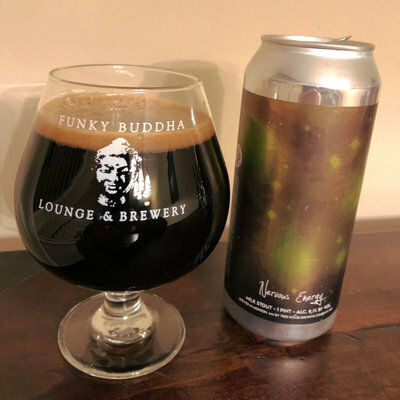 Not especially sure how to rate this, as it's probably an A- due to the strength of the base, but if you're looking for a Coconut stout, this might not fully scratch that itch, making it more of a B+. 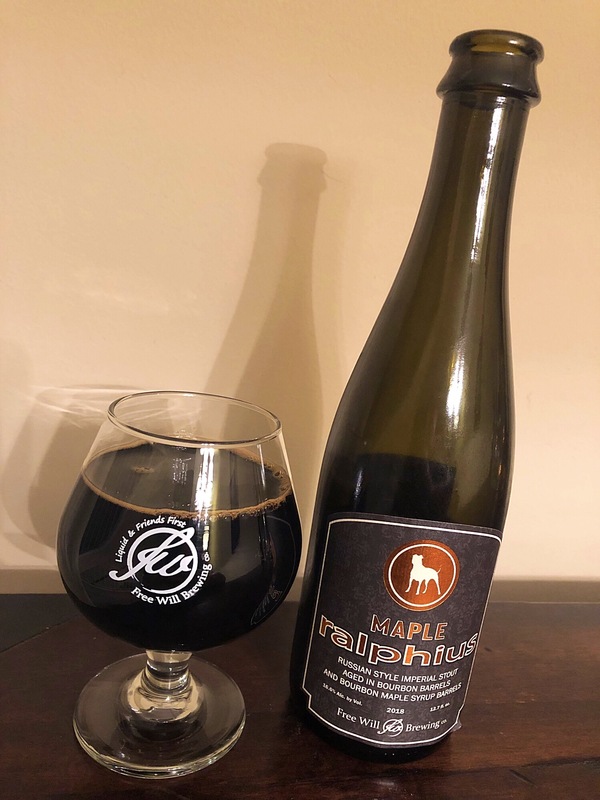 I never managed to snag the Iron Abbey Collaboration that Free Will made last year, which sounded an awful lot like this variant of Ralphius, so I can't really make the comparison, though I'd like to try sometime! Beer Nerd Details: 16.6% ABV bottled (375 ml). Drank out of a snifter on 11/27/18. Bottled Oct. 2018. A total of 600 bottles were produced. Beer Nerd Details: 16.6% ABV bottled (375 ml). Drank out of a snifter on 12/1/18. Bottled Oct. 2018. A total of 600 bottles were produced. Beer Nerd Details: 16.6% ABV bottled (375 ml). Drank out of a snifter on 12/8/18. Bottled Oct. 2018. A total of 600 bottles were produced. Beer Nerd Details: 16.6% ABV bottled (375 ml). Drank out of a snifter on 12/9/18. Bottled Oct. 2018. A total of 600 bottles were produced. Pretty sure the beer nerd details are, er, estimated, since they're all identical (except for when I drank it, which is precise and accurate), but you get the picture.